This is not a technical how-to article. This is testimonial about how information on the Internet helped me to fix a complex piece of technology. Anyone with simple tools, manual dexterity, and the ability to follow directions can do this. I'm inherently curious. I enjoy learning. I want to know how things work. I also enjoy a challenge. When my wife's iPhone 3 lost WiFi some time ago, I had to fix it. After experimenting with the configuration settings I determined it had to be a hardware problem. I did some research and found it was most likely related to cracked solder and the fix was to bake it. This guy explains why baking an iPhone 3 works and how to do it. We weren't ready for a new phone yet, and Karen could live without WiFi, so I didn't pursue it... Until this weekend. Karen finally got a new iPhone 5 a few weeks ago. My son, Emmet, wanted her old phone to use as an iPod (games and videos) but it wasn't very useful without a network connection, so I decided to fix it. Saturday morning was a stay at home day. Instead of reading, watching TV, or doing something else passively, I invested an hour to see what I could do. These instructions from iFixit gave me the information I needed to take the printed circuit board out. 20 minutes later I had the printed circuit board in the oven. Lo and behold, 25 minutes later (7 minutes to bake, the rest to cool an reassemble), WiFi worked! The moral of this story: Know what questions to ask and you get the information you need to fix. 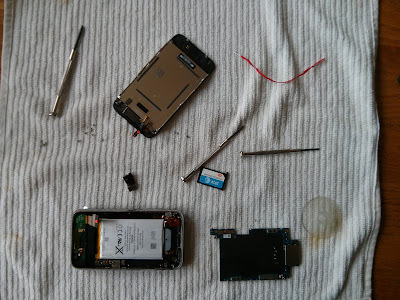 None of the software fixes worked, but there were several references to baking the phone. I followed the directions I found (linked earlier in this article) and an hour later the problem was fixed. There's a lot of incorrect or misleading information on the Internet, but with a little reading you'll find a general consensus and be able to triangulate the best answer for your situation. Why a new blog? I enjoy sharing my thoughts through writing. My first blog was Sail Donnybrook where I write about sailing on Lake Michigan. I write most during the boating season, which is around the corner, so expect some new articles soon. I starting Cycling, Health, and Fitness but lost interest. It's more fun to ride a bike and exercise than it is to write about it. I still ride as often as I can, but not as much as I'd like. I found Google Plus and am enjoying learning about it. I recently got a new phone, a Google Nexus 4. It's a fantastic device, especially when compared to the Blackberry I carried for so many years. It's opening up a new level of enjoyment just learning about it.